Oral surgery may occasionally be necessary to treat specific dental problems. If you do require oral surgery, our experienced and skilled dental team will ensure your treatment is as comfortable as possible and that you are properly cared for at all times. Oral surgery procedures include wisdom teeth removal, crown lengthening, surgical teeth removal, and tongue tie release (frenectomy) for young children. We make every effort to ensure our patients are relaxed and comfortable during all oral surgical procedures. We use the most sophisticated and up-to-date technology to diagnose and plan these treatments and to ensure any discomfort is minimised. When May I Need Wisdom Teeth Removed? If your wisdom teeth have yet to erupt, our dentist will keep a close eye on their development using digital dental x-rays to assess their position in your jaw. Often wisdom teeth will become impacted where they are positioned directly underneath existing teeth or they will emerge sideways. Some wisdom teeth will manage to only partially erupt, increasing the risk of infection and decay because they remain partly covered by gum tissue. If your wisdom teeth cannot erupt normally or have only partially erupted then we will suggest their removal to protect your dental health. Impacted wisdom teeth are often cut into several sections so smaller incisions are required. This helps to ensure their removal is smoother and more comfortable and that healing is faster. 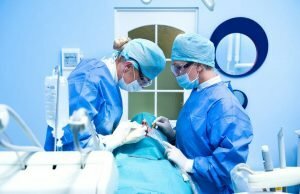 When Would I Need to Have Teeth Surgically Removed? Most tooth removals are extremely straightforward but a tooth with multiple roots or tooth roots which are curved may require skilled oral surgery to safely remove. This could also be the case if a tooth has failed to erupt, for example with an impacted wisdom tooth or if a tooth has become badly infected. A tooth that has received endodontic treatment and which has subsequently become re-infected can be more brittle and will need to be surgically removed if it cannot be re-treated. When Should I Consider Crown Lengthening? Crown lengthening is a sophisticated procedure designed to remove excess gum tissue, which exposes more of the tooth to create a more aesthetically pleasing appearance. We may also suggest crown lengthening in preparation for veneers or crowns, or where a tooth has broken off near the gums. By exposing more of the tooth, we can create a more successful restoration. When Would a Child Need a Frenectomy? Often a baby will be born with limited tongue movement, a condition that is called tongue tie. This is caused by a congenital anomaly where the lingual fraenulum is abnormally short. The fraenulum is the skin connecting the tongue to the floor of the mouth and which can restrict tongue movement. This condition is estimated to affect one in every 20 babies and may be hereditary. The extent of the tongue restriction can vary and if it is more severe it can interfere with feeding and suckling and as the child grows it could affect their speech development. A frenectomy is a small surgical procedure to release the fraenulum, allowing the tongue to move more freely.